The most important thing you can do to maximize your chances of getting in to top colleges is to apply to a range of reach, likely and safety schools. This risk-minimizing approach is often touted by college counselors and advice books, but the difficulty in implementing it is knowing which of the colleges on your list are actually reach, likely and safety schools for you. After all, there are so many different factors that go into college admissions these days. Go4Ivy can help you make informed decisions about where to apply by calculating your chances of admission at your list of colleges. 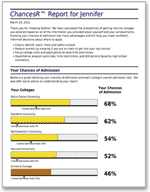 Our Ivy League-educated experts combine our admissions expertise with advanced statistical analysis to calculate your percentage chances of admission at the colleges you're considering. See if you are on track to get into your top choices or if you should retest. Ensure that the list of colleges you're considering includes a range of reach, likely and safety schools.